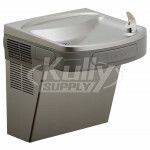 The EZSTL8C Water Cooler is a bi-level unit with front and side push bars. 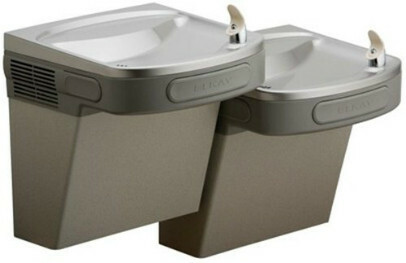 This EZ series drinking fountain that has a barrier-free ADA design that meets both adult and child standards. Easy-touch controls are used for simple operation and increased durability. Self-contained, wall hung electric refrigerated water cooler. Chilling capacity of 50°F drinking water, based upon 80°F inlet water and 90°F ambient. These Water Coolers comply with the requirements of A.D.A. (Americans with Disabilities Act) when properly installed. 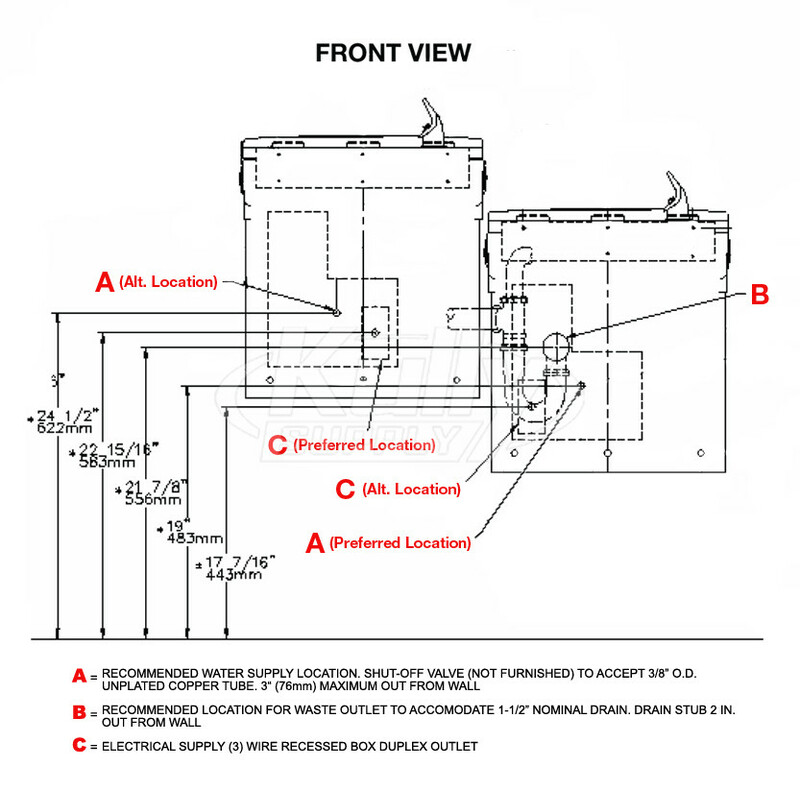 Unit is compliant if installed in an alcove and is also compliant when mounted on an exposed wall if a wing wall is located on the left side or if LKAPREZL apron is installed under upper unit. Also meets the guidelines for children’s environments providing the floor to orifice height is 30” or less on the lower unit and proper clear floor space is provided for parallel approach. (Based on Architectural and Transportation Barriers Compliance Board final ruling.) Check Local and State Codes. Motor Compressor: Hermetically sealed, reciprocating type, 115VAC, 60Hz single phase. Sealed-in lifetime oil supply. Equipped with electric cord and three prong molded rubber plug (domestic models). Condenser: Fan cooled, copper tube with aluminum fins. Fan motor is permanently lubricated. Cooling Unit: Combination tube-tank type. Tube portion is continuous coil of copper tubing. Tank is stainless steel. 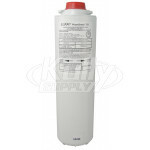 Fully insulated with EPS foam which meets Underwriters Laboratories Inc. requirements for self-extinguishing material. Refrigerant Control: Refrigerant HFC-134a is controlled by accurately calibrated capillary tube for positively trouble-free operation. 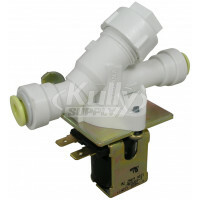 Temperature Control: Enclosed adjustable thermostat is factory preset. Requires no adjustment other than for altitude requirements. Easily accessible. Frame: Galvanized structural steel chassis supports refrigeration system and fastens to wall. 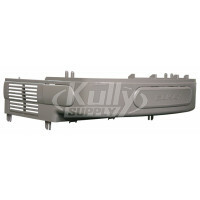 Provides increased structural integrity and rigidity to cooler. Stainless Steel Basin: Type 304, one piece polished to a uniform Elkay bright luster finish. Basin has integral drain grid, embossed bubbler pad. No exposed fasteners. Exclusive Flexi-Guard Safety Bubbler *: Innovative design utilizes an infused anti-microbial pliable polyester elastomer to prevent accidental mouth injuries. Flexes on impact, then returns to original position. Strong. Abrasion-resistant. Anti-sweat. Keyed in location to prevent rotation. Upper Shroud: Contoured shock-absorbing, provides additional protection against accidental injury. No exposed fasteners. Lower Shroud: One piece easy to remove and replace. Allows access to internal components from three sides. Cabinet: Cabinet design allows for flush to wall mounting. No recess space is required. Color Selection: Unless otherwise specified cabinet is two-tone gray upper shroud with textured gray lower shroud. Stainless Steel lower shrouds available at extra cost. No Lead Design water system is free of lead-containing brass parts. Barrier-Free ADA Design meets adult or child ADA standards when properly installed. Bi-Level Design offers the flexibility of a second unit at standard height. Extra Deep Basin minimizes splashing and its one-piece construction, with integrated drain, is vandal-resistant and easy to maintain. Easy-Touch Controls for easy operation and increased durability. 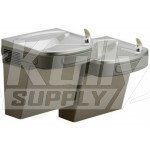 Flexi-Guard Anti-Microbial Safety Bubbler complements styling of cooler and is keyed into position to prevent rotation. Easy-To-Install Universal Design adapts easily to existing plumbing systems. Light Gray Granite Vinyl Clad Cabinet standard. Impact Resistant Vinyl Coating offers superior durability and performance. FIRST YEAR – - The Manufacturer warrants every water cooler, packaged water chiller, fountain and accessory to be free from defects in material and workmanship under normal use for (1) year from date of installation or eighteen (18) months from date of shipment from the factory, whichever occurs first. SECOND THROUGH FIFTH YEARS – The Manufacturer warrants the compressor and hermetically sealed refrigeration system, including cooling coils or tank assembly when part of the hermetically sealed refrigeration system, to be free from defects in material and workmanship under normal use for an additional four (4) years from the end of the one (1) year period described above. Packaged water chillers are not subject to the additional four (4) year warranty when used in chilled water commercial/industrial applications other than for potable water. INSTALLATION AND OPERATION – The foregoing Limited Warranty applies only when the product is installed and operated in accordance with the Manufacturer’s written instructions included with each unit. 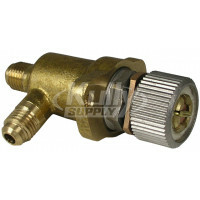 These products are designed to operate on 20 psi to 105 psi supply line pressure. Nonfiltered Bi-level units require a minimum of 40 psi supply line pressure to ensure adequate stream height from each bubbler when activated simultaneously. Bi-level filtered models, regardless of supply line pressure, cannot provide adequate stream height from each bubbler when activated simultaneously. It does not apply to products which, on examination by the Manufacturer, or its agent, are found to have been subjected to accident, alteration, abuse, misuse, misapplications, corrosive type atmospheres, or abnormal use. OWNER’S OBLIGATIONS – The owner has the obligation and responsibility to diagnose and/or make minor adjustments and to reimburse the authorized service center or the Manufacturer for any other repair not covered by the terms of this limited Warranty. Any appearance imperfections are to be noted at time of installation, and the installer or the supplier notified without delay. In the case of products located within the United States or Canada, the owner also has the obligation and responsibility to return the complete unit to the closest authorized service center or to the factory repair department. In the case of products located outside the United States or Canada, the owner is to return any part for which replacement is sought to the closest authorized service center or to the factory repair department. MANUFACTURER’S OBLIGATIONS – When the product is located within the United States or Canada, the Manufacturer’s obligation under this Limited Warranty is limited to the labor and parts to repair or replace any part which is expressly covered by this Limited Warranty at one of its authorized service centers or at its factory repair department. The Manufacturer’s obligation also includes cost of outbound freight (but not express freight) of the part or parts from an authorized service center or the factory repair department, but only if the Manufacturer determines that the part or parts, and the purported defect or defects are covered by this Limited Warranty. When the product is located outside the United States or Canada, the Manufacturer’s obligation under this Limited Warranty is limited to providing a replacement part for any part expressly covered by this Limited Warranty which upon examination by the Manufacturer or his agent, is found to be defective, but does not include any obligation to provide labor or to pay labor costs incurred in connection with the replacement. The Manufacturer’s obligations also includes cost of outbound freight (but not express freight) of the part or parts from the factory repair department to (but not beyond) the port in the United States from which the part or parts are shipped to their ultimate destination, but only if the Manufacturer determines that the part or parts, and the purported defect or defects, are covered by this Limited Warranty. WHAT WARRANTY DOES NOT COVER – This Limited Warranty does not include payment for any field labor to provide for normal maintenance including adjustments such as water stream height, water temperature or electric eye sensitivity. The water system and regulating valve are not covered by this Limited Warranty if they become inoperative due to liming, sand or similar residue. This Limited Warranty is voided if repairs are made by an unauthorized party or the serial number data plate is removed or defaced. Normal deterioration of finish due to use and exposure is not covered by this Limited Warranty. The Manufacturer is not liable for repairs, whether cosmetic or structural, to walls where cooler and packaged water coolers are built into the wall. If inlet pressure is above 105 psi, a pressure regulator must be installed in the supply line. 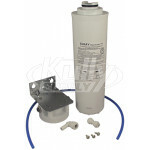 Any damage caused by reason of connecting this water cooler to supply line pressures lower than 20 psi or higher than 105 psi is not covered by this warranty. PERSONS ENTITLED TO BENEFIT OF WARRANTY – This Limited Warranty is applicable only to (i) purchasers who purchase the product for resale in the ordinary course of business, and (ii) the first person who purchases the product other than resale. THIS LIMITED WARRANTY IS IN LIEU OF ALL OTHER EXPRESS WARRANTIES, EXPRESSED OR IMPLIED, ARISING BY LAW OR OTHERWISE, INCLUDING WITHOUT LIMITATION, THE IMPLIED WARRANTIES OF MERCHANTABILITY AND FITNESS FOR A PARTICULAR PURPOSE. EXCEPT AS EXPRESSLY PROVIDED HEREIN, THE MANUFACTURER MAKES NO WARRANTIES, EXPRESSED OR IMPLIED, ARISING BY LAW OR OTHERWISE, INCLUDING WITHOUT LIMITATION, THE IMPLIED WARRANTIES OF MERCHANTABILITY AND FITNESS FOR A PARTICULAR PURPOSE, TO ANY PERSON. THIS WARRANTY MAY NOT BE ALTERED, VARIED, OR EXTENDED, EXCEPT BY A WRITTEN INSTRUMENT EXECUTED BY THE MANUFACTURER. THE REMEDY OF REPAIR OR, WHERE APPLICABLE, REPLACEMENT AS PROVIDED UNDER THIS LIMITED WARRANTY IS EXCLUSIVE. IN NO EVENT SHALL THE MANUFACTURER BE LIABLE FOR ANY CONSEQUENTIAL OR INCIDENTAL DAMAGES TO ANY PERSON, WHETHER OR NOT OCCASIONED BY NEGLIGENCE OF THE MANUFACTURER, INCLUDING WITHOUT LIMITATION DAMAGES FOR LOSS OF USE, COSTS OR SUBSTITUTION, PROPERTY DAMAGE, OR OTHER MONETARY LOSS. This Limited Warranty gives specific legal rights and in some states of the United States there may be other rights which vary from state to state. Q: What would cause unit (both sides) when activated to shoot water approx 2 feet upward? Is there a part we can order to fix this issue. Cooler has worked with no issues for about 12 years. 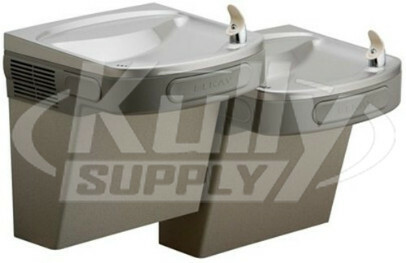 If both of your Elkay Bi-Level Drinking Fountains have water flow issues, it is likely that Calcium buildup is forming in your bubbler or you have a Defective Regulator Valve. 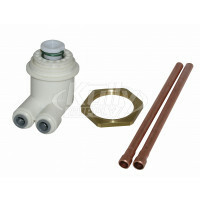 We recommend replacing the Elkay 92715C Flexi-Guard Bubbler Head Kit (Part #102494) and the Elkay 98531C Regulator Valve Kit (Green Spring) (Part #140048) on both fountains to ensure this issue is resolved. Q: Can you get just the right side of this fountain as a replacement or do you have to get both parts? 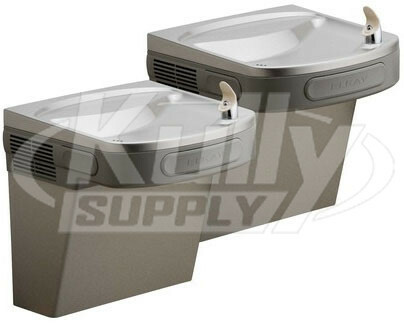 Q: What is the factory standard temperature that the drinking fountains are set at? A: These units come from the factory set at 50 degrees or colder. However, than can be adjusted to be colder than that by adjusting the cold control thermostat.